Sunday pancakes are the best thing about weekends. But last weekend I made the savoury kind. With cheese. And topped with a poached egg. It looked damn cute and tasted damn good. What’s not to like? Cheese, runny egg and spicy sriracha. With my hot cuppa it was the perfect breakfast. If poaching eggs scare you, welcome to my world. I can’t get it to look like a perfect quenelle. But I do have my little trick that saves the day and gives me a poached egg, slightly disfigured nevertheless. 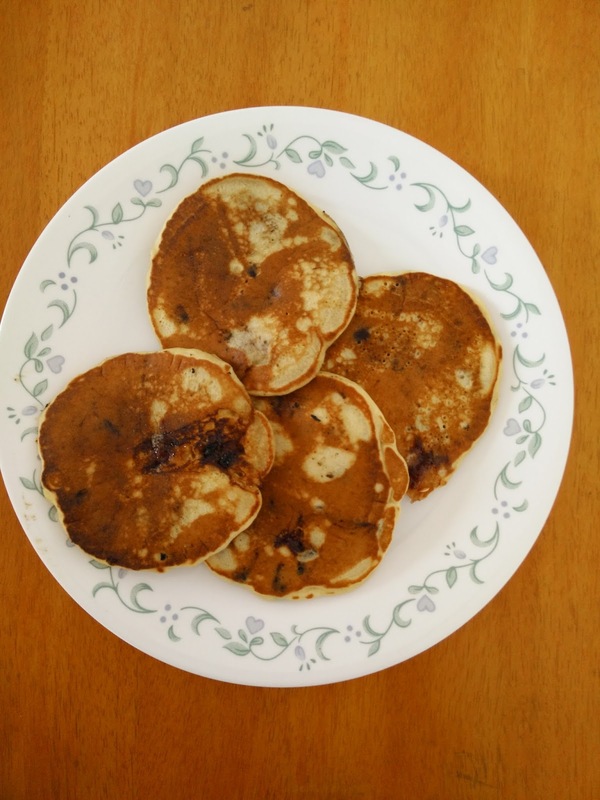 Pancakes have to be the easiest, most delicious and comforting breakfast treats. These have bananas in them and topped with more bananas, syrup and a hot chocolate sauce. The sauce is simply hot chocolate with extra cocoa to give it more thickness and make it more chocolatey. What I did with this recipe is add an extra egg white. It made the pancakes more fluffy and gave it the lovely tan it needs. There’s nothing else I can say about these except, dig in! Growing up, most sweets at home was made with coconut, jaggery and cardamom mixture. The heady aroma wafting through the house was a sign of things to come. I remember this mixture being ready and on the stove, still warm, waiting to be filled in rice paste lined turmeric leaves and then to be steamed. Obviously it was a long wait and all I wanted was a spoon of the sweet mixture. I’d eat a few spoonfuls and wait for the rest of the process to be finished. Making that sweet myself seemed like a task I’d take on another time and so I made something that’d have the same coconut and jaggery mixture. Pancakes. To compliment them, I made a caramel sauce with jaggery and ginger. I’m pleased to inform you that these are officially my favourite pancakes. It’s Pancake Day today, apparently. On this auspicious (how can pancake day not be?!) occasion, let me present you with wheat pancakes. Just good old atta replacing the evil maida (not to worry, you can have enough of it in your cake). Since it’s winter, there’s enough of strawberries rolling around in the market and in my kitchen. I just blended a box of them with a spoon of sugar. You can skip the sugar and add honey instead so it’s not all tart and no sweet. Mix dry ingredients (atta, baking powder and salt) together in a mixing bowl. Mix milk, egg and vanilla together in another bowl. Add the milk mixture to the dry ingredients and mix till everything is incorporated well. Do not over mix, else pancakes will turn out leathery and tough. Pour a ladleful of the batter on a hot nonstick pan and let it cook for a min on medium heat or till you see bubbles on the side of the pancake. Flip it and let the other side cook for 40 seconds to a minute. Strawberry sauce: Blend a box of strawberries (hulled and diced) with a spoon of sugar or honey. Serve pancakes with strawberry sauce along with other fruits and honey or maple syrup. Pancakes are the easiest thing to make in the mornings and it’s Friday, so it’s also a good excuse to make them. These are light, fluffy and delicious with some fresh strawberries and syrup. If you don’t have any syrup, use honey like I did. Pancakes are so versatile. So many ways of making them. With chocolate, with fruit, with jams and jelly, savoury – so many! 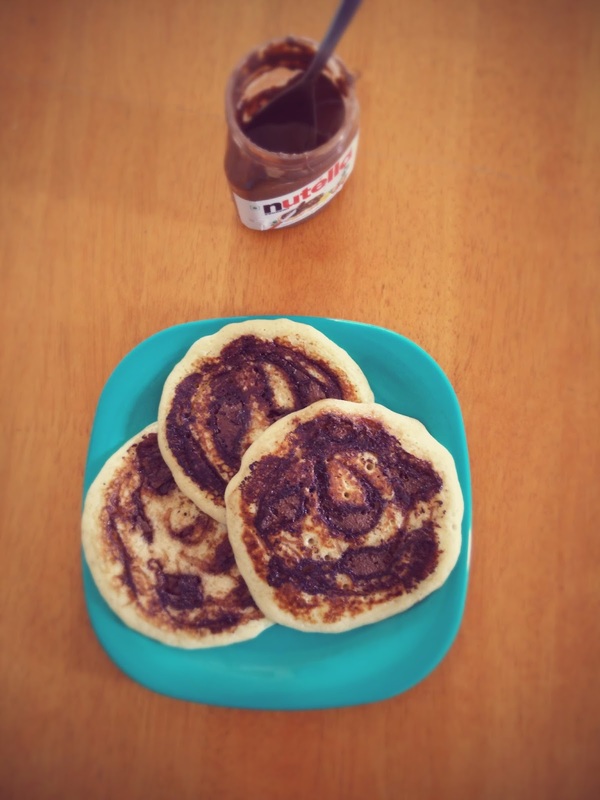 Today I made Nutella swirl ones. Take this pancake recipe and omit the peanut butter (or keep it), and just swirl the Nutella over the side up of the pancake when it’s on the pan. Simple! 1. Get the dry ingredients in a bowl together – flour, baking powder and salt. 6. Grease a nonstick pan with oil/butter. Make sure it isn’t smoking hot else the pancake will burn without cooking through. 8. Pour this on to your pan and let it cook on one side – when you see bubbles forming on the top side, flip it over and let it cook for minute on the other side.